Indian captain Virat Kohli has pulled off a remarkable catch to dismiss Peter Handscomb as India staged a fightback in the second Test. After a 112-run opening partnership, Australia steadily lost wickets in the second and third sessions, but the highlight of the day was undoubtedly Kohli’s stunning grab which rivalled that of Usman Khawaja’s from day one of the first Test. The incident occurred after the tea break as Ishant Sharma got stuck into a spell more reminiscent of his form in Adelaide. Handscomb attempted to cut a ball that was too close to his body, edging the ball through to the Indian slips cordon. 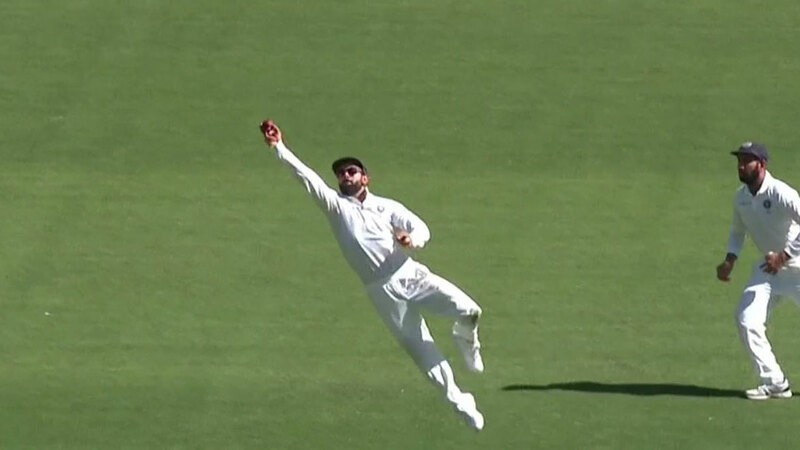 However, after the edge there was a lot of work for Kohli to do to get to the ball, as he perfectly executed a full-length dive to snaffle the ball in his right hand, leaving Handscomb stunned. The unbelievable effort from Kohli meant another low score for Handscomb who has come under increasing pressure following a pair of low scores in Adelaide. Following Australia’s decision to bat first, the pitch appeared to play well throughout the first session, but became alarmingly inconsistent as the day wore on. The extra bounce not only claimed Handscomb but also opener Marcus Harris, who was caught at slip after a ball from part-time off-spinner Hanuma Vihari reared up and caught the shoulder of the bat.